Shiru is the oldest among her three brothers and two sisters. Thirteen years ago, at age nine, she was home alone cooking on an open fire. She got too close and her clothing caught fire. Neighbors came to her rescue but not before she suffered severe burns on her face, torso and arms. As her body healed the scar tissue contracted leaving her lower jaw and left arm attached to her chest. Her parents saw a poster about Rotaplast coming to Chittagong and they made the four hour journey for her first surgery in 2014. 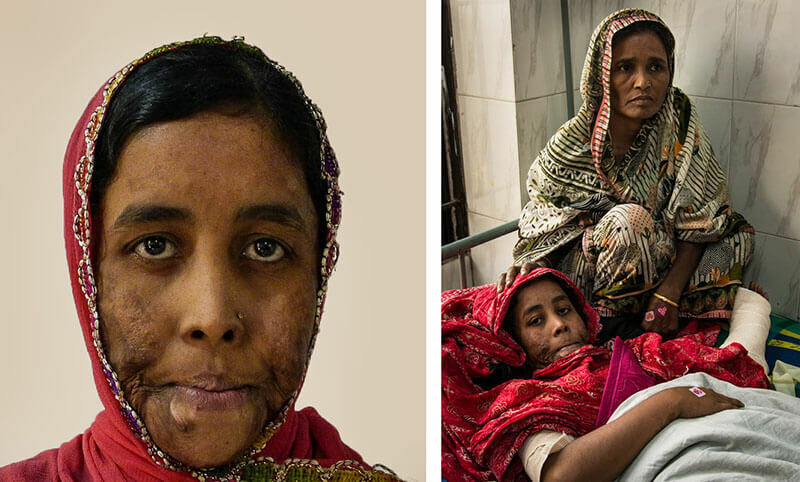 As usual, victims of severe burns require multiple surgeries. Shiru returned last year and Dr. Rod Simmonds performed skin grafts that allowed her to raise her head for the first time in 13 years. Shiru’s father sold vegetables from a cart but can no longer work due to illness. The family has no source of income and with help from neighbors, they were able to return to this year’s Rotaplast mission. Dr. Simmonds treated Shiru again with extensive skin grafts so she can now raise her left arm. Shiru’s mother told me that they tried to get help for her at a hospital years ago. They paid a lot of money but got no results. As I stood by her bed, Shiru gave an appreciative smile and reached out to take my hand. She and her mother are thankful for the excellent care from Rotaplast.